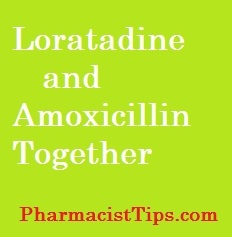 Can loratadine and amoxicillin be taken together? Can you use this popular allergy medicine with a penicillin antibiotic. Loratadine is a once a day non-drowsy antihistamine or allergy medicine. It is sold in the US under the brand name Claritin. There is no interaction and they are safe to use together. Most cold and allergy preparations are safe to use with amoxicillin. If you are not sure I would encourage you to ask your pharmacist. It is common to use over-the-counter remedies when using an antibiotic. Symptoms may need to be treated while the antibiotic begins to work. And, keep in mind it is usually best to finish the full course of antibiotic to ensure the infection is completely eliminated. I hope this information is useful to you. If you have any medicine or pharmacy questions, please ask me. It is best to talk to a health care provider before starting or stopping any medication.